Welcome follower of the old Necrotyr ways and curious genobiologi alike, in this series of posts I will be going through the many units, wargear and tricks you may be encountering in the near future when your local gaming table gets invaded by the Necrons. I started working on these posts about two weeks ago when I also started working together with some fellow Astronomican Forums members to provide some useful information and help for our fellow 40K fanatics. I will be discussing the new rules and tactics you will be encountering, after which each individual unit and character will be discussed, finishing up some discussion about the greyer areas in the rules. 1. Though the new codex has a lot of powerful stuff in it, nothing jumps out as much as in other codices like the Grey Knights and Dark Eldar. Though we are bound to see quite a lot of Canoptek Swarms, Stormlords and Crypteks out there, be prepared to face a number of varying armybuilds. 2. 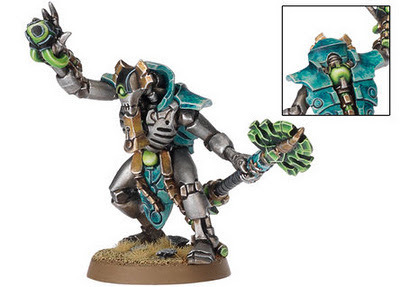 Reanimation Protocols – Most Necron infantry have the ability to self-repair after even the most grievous of wounds. At the end of a phase almost every Necron infantry model has a 33% chance of standing right back up again, which can be improved to 50% if the unit is joined by a Lord or Overlord with a Resurrection Orb. If a unit is fully destroyed in combat these Reanimation Protocols will not work, this is also the case if the last survivor is a joining character. 3. Ever-living – Necron Overlords and characters also have the ability to self-repair after being cut or shot down, but have a bit more flexibility in placement if they are by themselves. They will get back up with a single wound remaining on their profile, however the Necron (Over)Lord can improve this to D3 wounds by buying the Phylactery wargear. 4. Entropic Strike – certain Necron close combat weapons and units have this rule, which has a dual effect. First, any unit that suffers an unsaved hit will lose its armour save for the remainder of the game, better keep those multi-wound units and named characters away from Canoptek Swarms and Triarch Praetorians! Secondly, and most devastating, for each hit made against a vehicle a D6 is rolled. On a 4+ the vehicle loses one AV on all facings. If this takes a facing down to 0, the vehicle is destroyed. And it is for this specific rule that will be seeing and fearing the large number of Canoptek Swarms in the near future! 5. Night Fighting – In between the Stormlord named character and Crypteks with Solar Flares, there will be a fair chance that you will be dealing with the Night Fighting rules on a regular basis. Be especially weary of Imhotekh the Stormlord’s ability to start the game of with Night Fighting, combined with a Cryptek with a Solar Flare that can turn it off at any time or restore it once it runs out of juice! 6. Necron Mobility – Though the majority of the army has to cope with Initiative 2, the Necrons’ abilty to move units and vehicles across the battlefield is far from static. Entire units have leave play and Deep Strike right back in, transports may be destroyed only to have their unit arrive as reserves instead. The general message here simply come down to that it is a tough job to bring and keep a Necron down! 7. Gauss Weaponry – Gauss weapons are carried by Warriors, Immortals, Destroyers and the Monolith. Any armour penetration roll made with such weapons will automatically score a glancing hit on a 6, unless it would already do so. In other words, even the lowly Gauss Flayer can do serious damage to vehicles. 8. Tesla Weaponry - these weapons have a chance to hit multiple targets with a single hit. Every to hit roll of 6 leads to the target suffering two additional hits. The Tesla Destructor even extends this potential of arcing damage to other, nearby enemy units. 9. Quantum Shielding – most Necron vehicles have Armour Value 11 allround, however most of them also have access to Quantum Shielding. This piece of kit raises a vehicle’s Armour Value on its front and side facing by 2, until the vehicle suffers a penetrating hit. This will keep your those Necron vehicles safer from those pesky Missile Launchers. 10. Living Metal – vehicles with this rule ignore any ‘crew shaken’ results on a 2+ and ‘crew stunned’ results on a 4+. No more melta immunity anymore I'm afraid, looks like that exclusive to Blood Angels and Grey Knights. There are of course many other rules and pieces of wargear in the codex, but these 10 pointers will prepare you for your first encounter with the new Vaudevillian Necrons! The Necron Overlord is one of only two basic HQ choice available to the Necron Player, though quite durable this guy really lacks any kind of close combat punch or invulnerable save. As a result, most players will quickly add a warscythe, though at 45 points it is just too expensive to give him that much needed invulnerable save. The Overlord has access to quite a few nice tricks including a flamer weapon, mind-controlling an opponent in close combat letting him/her attack their own troops (though they get to do a Ld. test on 3D6 to resist first) and increased resurrection power for both himself and the unit he joins in the form of a Phylactery and the iconic Resurrection Orb. In addition we have the rather nasty, one shot Tachyon Arrow with infinite range S10, Ap1 and the Tesseract Labyrinth that can also be used once to trap and remove an opponent in close combat. 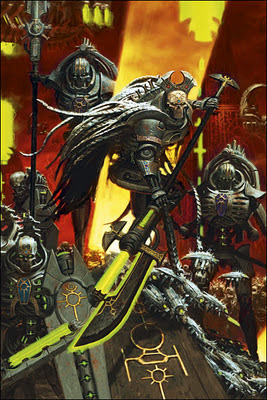 The Necron Overlord can also be upgraded to a Phaeron, which is not only a nice sounding, higher rank title that indicates this Necron noble stands at the head of a full dynasty, but makes him and the unit the joins Relentless (fire heavy & assault weapons as if you remained stationary and still assault in the same turn). This is one way to make both Necron Warriors and Immortals with Gauss Blasters a lot more dangerous & mobile! All in all the Necron Overlord has quite a few tricks up his sleeve, but ability wise, point-for-point, the named characters outperform this guy on virtually all dimensions. In fact the main reason people will take this guy is to open access to the Royal Court to may take for each one. Simply put the is a nice, for Necrons cheap solution that should be kept simple to save points to invest into his Royal Court. The Overlord can also right a Catacomb Command Barge, which definitely adds a lot of appeal and will be discussed in tomorrow's post.. The new Destroyer Lord simply hates everybody (Preferred Enemy – everybody), now counts as Jump Infantry (so sadly he can’t keep up with Canoptek Swarms) and generally has access to less toys than his more sane Overlord counterpart. So effectively for a 35 point increase you get Jump Infantry, re-rolls in close combat, S6 and 2d6 armour penetration thanks to his Warscythe. Not too bad if you ask me, most of the extra options really aren’t worth it. Mindshackle Scarabs could be useful, same goes for a Resurrection Orb if you plan to keep him close to other units with Resurrection Protocols. In all honesty the Destroyer Lord won’t see much use in small armies, in which Overlords and Named Characters will be picked over him both for their superior supporting abilities and access to the Royal Court. This is one the more versatile and interesting options in the book as for every Overlord (normal or Named Character version) you get to take a Court of 0-5 Necron Lords and 0-5 Crypteks. Court members can be used in two ways – either to form a separate unit or they can they can be attached as sergeants to a unit of Warriors, Immortals, Deathmarks or Lychguard (though only a single Court member can be attached to each squad). The Necron Lord is in essence a single wound, cheaper version of the Overlord and has access to many of the same tricks. I doubt we’ll be seeing a lot of these guys as they simply don’t have enough staying power to be off use in close combat and stacking up on multiple ones to take more Resurrection Orbs gets real expensive, real fast. They can make for a nasty surprise when attached to a smaller sacrificial, buffer unit when equipped with such tools as Mindshackle Scarabs or a Tesseract Labyrinth. In the end, I think these guys will only pop up when a Resurrection Orb is really needed or when an opponent has 50-60 points left and doesn’t want to spend them on Canoptek Swarms or Spyders. The Cryptek, on the other hand, is a true, cheap gem that will see massive and varied use. 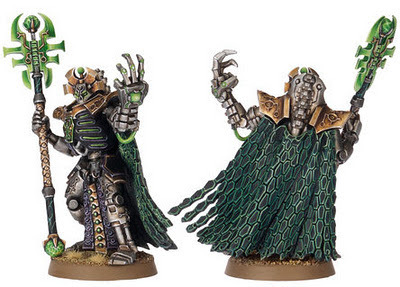 The Crypteks are the technological elite of a Necron dynasty and have access to five different schools of abilities. Though multiple Crypteks from the same Royal Court may originate from the same school, each item available to those schools may only be taken once per Royal Court. Each school also provides the Cryptek with a different special weapon and you will really want to do that as there are just too many cool options to stick with the standard Staff of Light. With a template weapon that can decimate low Ld. Troops,access to forcing enemy Morale checks and the ever useful ability to redeploy using the Veil of Darkness’ Deep Strike ability this guy is going to see a fair bit of use. Combined with the open-topped Ghost Ark I can foresee the Abyssal Staff being a nasty little trick as well. Though their weapon of choice isn’t all that useful, the ability to buy defensive and offensive grenades is. The same is true for the Solar Pulse and its ability to the end Night Fighting or to activate if for one turn. Imhotekh is bound to have one of these guys around! These Crypteks have the ability to add a re-roll to their squad, gain a 3+ invulnerable save or to stun an opponent, reducing their profile for the remainder of the battle. Not the most useful of builds, though it is one of the cheaper versions. One of my favorite Cryptek versions, mostly because of their very supportive role. Their trademark weapon can unleash a hail of short-ranged fire, but it also capable of doing some serious vehicle damage. It gets more interesting though when we look at the special gear they can buy, first we have the Ether Crystal that can really help to safeguard against Deep Striking nastiness by unleashing D6, S8, AP5 hits on enemies that Deep Strike within 6”. The second option is the Lightning Field that does the same, but to those foolish enough to assault the unit the Cryptek has joined. If you take all these options on a single Cryptek you’re only out 50 points and will have the best Assault defense in the entire book. Another very interesting Cryptek build, their standard weapon is capable of turning open terrain into difficult terrain for 1 turn for a unit hit by its blast. In addition he’s able to reduce the assault range of enemy units, they are also the only Cryptek type that can take a second ranged weapon: the Harp of Dissonance. Though this one isn’t all that useful for its cost and the necessity of shooting at the same target at the unit a Cryptek has joined. Imotekh, Imotekh…..IMOTEKH, uhm alright enough Mummy referencing for today. Imotekh is the most expensive of the Named Characters in the codex and for those 225 points you get a lot of stuff. He is very durable with 2+/3+ saves, D3 wounds upon Resurrection, he causes D3 wounds when taking out an enemy character, can take the Initiative against all but the Orks, has an awesome weapon, is a Phaeron (Relentless for him and any unit he joins) and makes Flayed Ones a lot more dangerous. On top of all this he also makes the game start out using the Night Fight rules, which can last for several turns. In fact, the only thing really missing here is a Resurrection Orb, though this seems to be lacking on most of the Named Characters. I think Imhotekh is going to follow the same path as Asdrubael Vect, requiring a bit of practice, but resulting in a very, very dangerous character. Not in the least because of his awesome one-use weapon that fires in a straight line of 2D6 and causes a number of S6, AP1 hits equal to the number of models in each of the units hit. That is going to seriously mess up whatever gets in front of him! Ah, Szeras, you awesome looking piece of artwork. I truly hope GW will make an actual model for this guy. Szeras is essence an upgraded Cryptek of the Harbingers of Destruction with two wounds, Gaze of Flames and an Eldritch Lance. At a 100 points he is the cheapest available character and he also has the ability to upgrade a single squad of Warriors or Immortals at the start of the game. Much like Fabius Bile you have no control over how Szeras’ tinkering will affect them though, with 1/3 chance at Toughness 5, Ballistic Skill 5 or Strength 5. Competitively I don’t really think he’s worth it, especially since he doesn’t offer access a Royal Court. Though at 100 points he makes for a nice, supportive character if you have the points to spare. Orikan is the second Cryptek character and his forte lies in the field of time manipulation, particularly the ability to re-roll stuff in close combat and reserve rolls. Whatsmore when the stars align Orikan can be restored to his former power, drastically increasing his profile. However this power can stop just as soon as the next turn and wounds suffered in his empowered form carry over to his normal form. In other word, if Orikan would suffer two wounds, revert back to normal and as a result would die right there on the spot. For me, this simply makes him too random especially since you have to roll each turn for his empowered profile. On the positive side though, he makes all enemy movement in the game’s first turn count as moving through difficult terrain with the lowest D6 rather than the highest been chosen. Nice gimmicky character, but just random to be a competitive choice. Trazyn is rather interesting as he quite simply refuses to die, once he loses his last wound he has 5/6 chance to take over the body of any Overlord, Lord, Lychguard or Cryptek on the field. In addtion he count as a scoring unit and can case mayhem in close combat. First off, he has Mindshackle Scarabs that can cause a character to strike at his own troops. Secondly we have the Empathic Obliterator that has 50% chance to kill similar models. For example if Trazyn kills an Ork Boy, your roll a dice for every other Ork Boy in the combat and on 4+ they also suffer a wound. On top of that he is also a Phaeron (Relentless for him and any unit he joins). Trazyn may be the most reliable of the available characters and at 175 points he’d better be! The best way to describe Nemessor is as a pure and simple steal. You can build a normal Overlord with the same gear for only 5 points less, while you still get a hefty number of special rules on top of it for Zahndrekh! 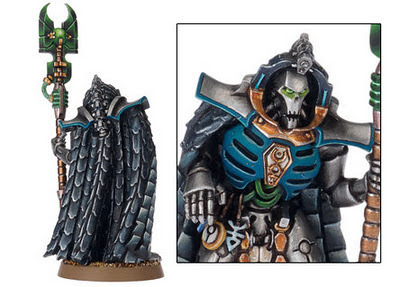 For those 185 points you get a quite durable Overlord, the only one with a Resurrection Orb and with the added ability to make Reserves come in during your opponents movement (next edition hints anybody? ), add one special real to a single unit each turn and take one away from an enemy unit. It really comes down to abilities versus points and you simply won’t get as much for your buck from other characters as you will with Zahndrekh! Obyron is Nemessor Zahndrekh’s bodyguard, so if both are taken Obyron doesn’t cost you an HQ slot. In essence he is a pure fighter that has a Veil of Darkness that even works in close combat and he can also return to his master’s side whenever Zahndrekh gets in trouble. Obyron is a pretty nice fighter, especially when opponents fail to hit him. For each failed to hit roll against him he gets to make an extra attack, up to a maximum of 6 bonus attacks. His big downside though is that he too lacks any kind of Invulnerable Save, reducing his durability quite a lot. I really doubt we will be seeing a lot of this guy. Now this guy can potentially do a huge amount of damage, with a Warscythe, Counter-Attack, Furious Charge and the ability to take over an enemy vehicle within 18” he is going to cause a lot of problems for your opponent. The Tachyon Arrow also comes in handy against those pesky Grey Knight 'transformers' and the ability to upgrade a single unit of Immortals with Counter-Attack and Furious Charge for free is always nice. His clear weak point though, is the complete lack of Invulnerable Save. In other words, if your opponent decides to make him his/her priority he’s in for a serious fight. At the same time being able to turn, for example, a Demolisher on its own troops is a very interesting ability! And that does it for today, check back tomorrow for the Troops, Dedicated Transport and Elite sections!